If you sat in one place on Earth, you’d have to wait a really long time to see a total solar eclipse happen overhead. “You’d wait 300 years. And that’s on average,” says planetary physicist Paul Doherty, senior scientist at San Francisco's Exploratorium. Doherty has seen nine total solar eclipses in his life. He’s traveled to the Gobi desert, floated the Zambezi River and sailed to remote atolls, all to witness a cosmic phenomenon that most people will never see in their lifetime. But this summer, some Americans will have their chance. A total solar eclipse is set to sweep across the central United States on August 21. Even though California won't get the total show, it'll be an event pretty much everywhere. So we checked with Doherty and other local experts to find answers to your burning questions about the big day. How Can I Safely Watch the Eclipse? It bears repeating: do not look directly at the partially-eclipsed or un-eclipsed sun. And this part you may not know: do not look at the partially- or un-eclipsed sun through camera, telescope or binocular lenses with or without eclipse glasses, because the concentrated rays coming through those lenses can penetrate the eclipse filter and damage your eyes. The FTC has issued a warning to protect consumers from eclipse glasses that don't meet international safety standards. Eclipse glasses offer a safe barrier between the sun and your eyes for the most direct viewing. Wearing eclipse glasses — which filter out the sun’s harmful rays — will allow you to look directly at the sun as the moon passes in front of it and casts its shadow on Earth. Everyday sunglasses are nowhere near powerful enough to shield your eyes from the sun. NASA advises that removing eclipse glasses is okay only during full totality. 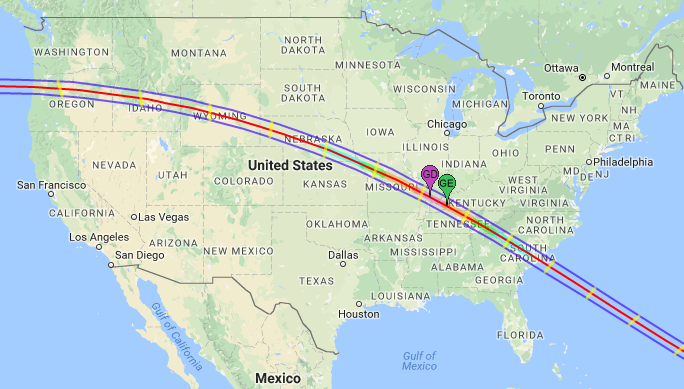 If you’re not in the path of totality (i.e. anywhere in California), it will not be safe to look at the sun during any part of the eclipse. Live stream the total solar eclipse and see stunning images beamed right to your smartphone or laptop. Those stuck inside at work, or outside the path of the total eclipse won’t have to miss a thing. The Exploratorium recently launched its free Total Solar Eclipse App for iOS and Android, which will feature two live telescope streams from the path of totality, a Spanish live stream and more on the big day. "If you were not in the path but you were outside, you could look at the sun through your eclipse glasses and look at the totality on the app,” says Exploratorium Director of Moving Images Nicole Minor. Make a pinhole viewer to watch a partial eclipse. That’s called projected viewing, and it can serve as a fun craft project for the whole family. Ben Burress, staff astronomer at the Chabot Space & Science Center says you can use almost anything with a small hole in it to focus sunlight onto a white surface. A kitchen colander, your interlaced fingers and even natural features can safely project little eclipses. “We even have shadows of trees cast on walls, and it’s this pattern of leaves but inside it’s little crescents,” he says. You can also magnify the projection using a mirror or binoculars. On August 21, Chabot Space & Science Center will have on hand special telescopes for watching the eclipse, as well as solar viewers, projection viewers and other ways to safely watch the partial eclipse. Can I Take a Picture of It With My Smartphone? It depends. Your smartphone camera is like your eye: it can fry when pointed directly at the blazing sun for too long. Don’t risk it; use a filter. During totality it’s okay to take a picture of the eclipse with just the corona visible around its outside edges -- but that image will be really small. And there is a more important question at hand here: Do you really want to experience a once-in-a-lifetime astronomical phenomenon through a 4-inch rectangular screen? Doherty said his favorite way to take in an eclipse during totality is with his own two eyes. I’m Traveling to the Path of Totality: Where Should I Go? It does matter. Moving closer toward the center of the path will maximize your time in the shadow, which could last about two-and-a-half minutes. As you move toward the outer edges of the path, the time in totality will dwindle down to just seconds. Still, the entire spectacle from partial eclipse to totality and back will take hours, according to Burress. Doherty has one piece of advice for eclipse chasers: be flexible. Check the weather report and be ready to move on short notice in case the clouds move in to the forecast. The long-range outlook, he says, is promising for both locations of the Exploratorium’s live streams with a 75 percent chance of clear skies in Madras, Oregon and Casper, Wyoming. When the moment comes and the moon fully blocks out the sun save for just the wispy white spindles of the corona, Doherty says you’re in for a profound experience. Doherty may have seen nine total eclipses but his enthusiasm for the experience hasn’t waned. What Can I Do to Get Ready for Aug. 21? 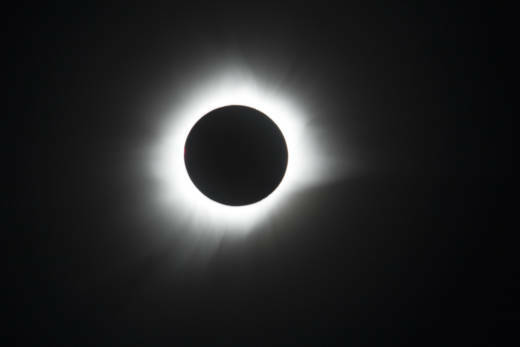 If you can’t make the trek to see the total eclipse in person, tune into one of the five live streams available on the Exploratorium app: in-depth scientific coverage in English and Spanish; two three-hour telescope streams from Oregon and Wyoming; and a live sonification of the eclipse complete with musical interpretation of the totality by the Kronos Quartet. The app also features a series of videos with insight into the science and culture behind eclipses and tips for safe viewing. And KQED Science will have reporters in the band of totality, from Idaho to Tennessee. Programming at the Exploratorium and Chabot will offer enhanced remote viewing and educational activities centered on the science behind the eclipse. And then there’s the sky. Burress says the Bay Area will be treated to a partial eclipse with about 75 percent of the sun covered up. He says there will be notable darkening of the sky here. However you choose to take in the eclipse, the experts advise to take your eyes off the sun every once in a while and take in the scene around you.